We went on a little family drive yesterday with our main destination being the Apple Station in Union Springs. The owners are old buddies of Ed's and they run a great place with fantastic apples, veggies, pumpkins, NY cheddar and homemade donuts. Yum! 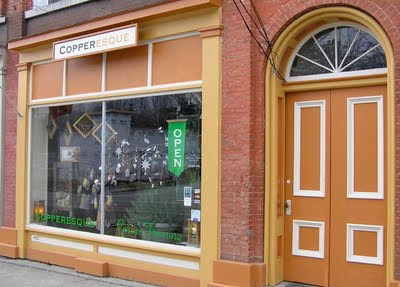 As we were driving home we noticed that Coppersque was open. I've never happened upon the store when it was open, so I was thrilled to finally go in and see what they had to offer. I was instantly smitten with the leather bags by Paulette Rollo of Maine. They only had a few items left in stock, but I managed to snag a small heart-shaped leather bag that is just charming. I need to get a good photo and I'll post in here soon. 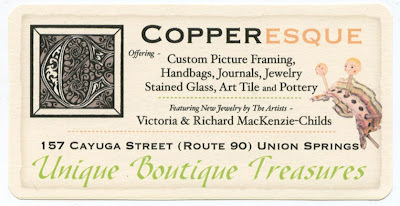 In the meantime, check out Copperesque, either in person or on their website.